Exceptional accommodation amongst the vineyards & olive groves of Marlborough. Take a step back in time and enjoy the timeless elegance of ‘The Peppertree’, a gracious five star rated Edwardian Villa built in 1901. Nestled quietly amid the world famous Marlborough wine region of New Zealand and surrounded by 10 acres of farmland, vineyard, olive grove and beautiful gardens, it is the ideal base from which to tour the region or a treasured retreat where time stands still. The timeless feel of this beautiful boutique lodge flows through into each of the five spacious guests suites, each individually decorated and complete with fireplace, verandah or balcony. You will enjoy the heritage feel along with the modern conveniences and above all, the old world hospitality that your hosts, Heidi & Werner, are able to offer. 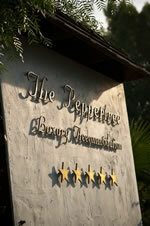 Please take some time to explore our website and learn more about ‘The Peppertree’ Lodge. Luxury New Zealand Lodge accommodation, The Peppertree is situated close to the Marlborough Sounds, in sunny Blenheim. The Peppertree is a luxury historic boutique hotel offering the perfect retreat for exploring Marlborough.